Ideal working dilutions for each application should be empirically determined by the investigator. Immunogen :The antibody was produced against synthesized peptide corresponding to the C-terminus of the human protein conjugated to KLH. 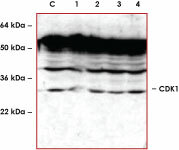 Sample Data :Western blot using Anti-CDK1 antibody to detect CDK1 in MCF-7 cell lysates. 1. Vantieghem, A. et al: Phosphorylation of Bcl-2 in G2/M phase-arrested cells following photodynamic therapy with hypericin involves a CDK1-mediated signal and delays the onset of apoptosis. J. Biol. Chem. 2002; 277(40):37718-31. 2. Rigas, A.C. et al: Therapeutic potential of CDK inhibitor NU2058 in androgen-independent prostate cancer. Oncogene. 2007; 18.